Two more weeks to go until my first full marathon. Last week I had my longest training run of about 37k/23miles. I ran it with a fellow food blogger from Dubai. As I do all of my training runs on my own (which can be getting very boring on the long runs), this was a most welcome change of scenery. One was pulling the other through tired phases. We chatted along for about 90 minutes, and ran the rest with just a few remarks every now and then. I feel confident that I can run the distance on race day. And the fact that I could do another very fast run (actually race) of 7k/4miles just 48 hours later, gave me even more confidence. Now it's tapering time. Which means less and less running and a focus on good food. Lots of protein this week, to help recover the torn muscle tissue from last week's long run. And otherwise salads. I will never get tired of combining new and different veggies in a salad. Only recently I started adding a new dimension to my ways of eating: food combining. Different foods require different digestive environments, e.g acid OR alkaline. If such foods are combined in one meal, the digestive juices neutralize each other and, therefore, cannot be properly digested. The result can be bloating, gassiness or tiredness. Foods will take much longer to pass through the digestive tract. A common example for this are starchy foods (rice, potatoes) combined with protein (meat, fish). I have tried to cut out one or the other from my dinners, and either have rice with veggies only OR combine fish/meats with veggies. It works great for me. I feel full after the meal, but not lazy or worn down. That's why there is even more reason to get exciting and tasty salads and side dishes on the table. This salad consist of roasted pumpkin and carrots to provide sweetness, combined with some leafy green arugula, fresh and fruity pomegranate arils topped with feta cheese. Add some toasted nuts if you like. An utterly delicious salad that can be made in advance and will be good for a healthy lunchbox too. Toss pumpkin cubes and carrot slices in olive oil. Season with salt and pepper. Spread out on baking sheet in single layer. Roast in the oven for about 20 minutes. Turn veggies over after 10 minutes to provide even roasting. Cut the pumpkin cubes in halves. 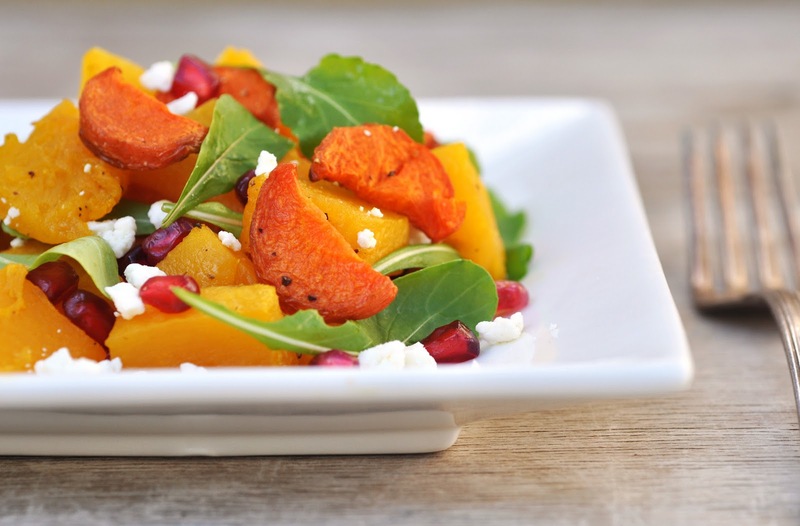 In a serving bowl, combine pumpkin, carrots, arugula and pomegranate. Combine olive oil and balsamic vinegar for the dressing. Pour over salad and toss. Sprinkle with feta cheese crumbles.